Researchers from Boston’s Massachusetts General Hospital have developed a unique probe that illuminates blood clots located anywhere in the body with just one scan. With the current methods and technologies, finding the exact location of a blood clot in the body can be a very time-consuming process, because each section of the body needs to be looked at separately using a different type of scanning method. For instance, ultrasounds check the legs or arteries, a magnetic resonance imaging (MRI) scan may be used to check the heart, and a computed tomography (CT) scan looks at the lungs. 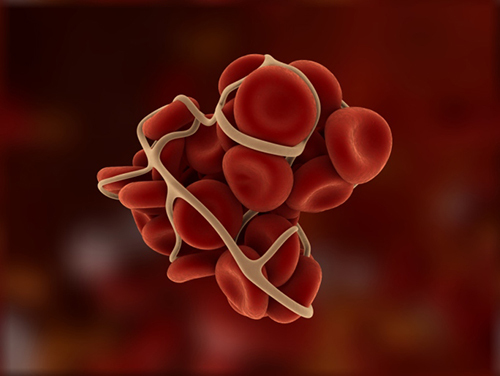 If blood clots are not found and treated as soon as possible, a blood clot can trigger a stroke, heart attack, and various other medical conditions that make it potentially fatal. It can also break apart and create more clots throughout the body. Being able to locate all clots with one single scan would cut down on time and allow doctors to get to them faster. To test the new method, a team of researchers attached a peptide known for binding to fibrin (a protein fiber found in clots) to small radioactive isotopes called radionuclides, which get highlighted anywhere in the body when the patient undergoes a positron emission tomography (PET) scan. After finding the 15 most effective combinations of radionuclides and peptides in test tubes, the researchers tested them in rats with blood clots. Because the body metabolizes some of the probes (something that doesn’t happen in test tubes), the researchers were able to isolate one specific combination that could withstand the body’s metabolism. The next step will be to test how effective this combination, dubbed FBP8, is in human patients. Human trials are expected to begin later this year. “New method could detect blood clots anywhere in the body with a single scan,” American Chemical Society web site, August 17, 2015; http://www.acs.org/content/acs/en/pressroom/newsreleases/2015/august/blood-clots.html. Paddock, C., “Single scan finds blood clots anywhere in the body thanks to new probe,” Medical News Today web site, August 21, 2015; http://www.medicalnewstoday.com/articles/298417.php.